NEW YORK (WABC) -- The trial of a New York City police officer charged with manslaughter was adjourned for the day Monday after an injury to one of the jurors. Juror number 10 banged his knee and was taken to Kings County Hospital for treatment of a swollen knee. The trial is expected to resume Tuesday pending a further evaluation of the condition of the juror. Two key witnesses are scheduled to take the stand when the trial of Officer Peter Liang resumes. 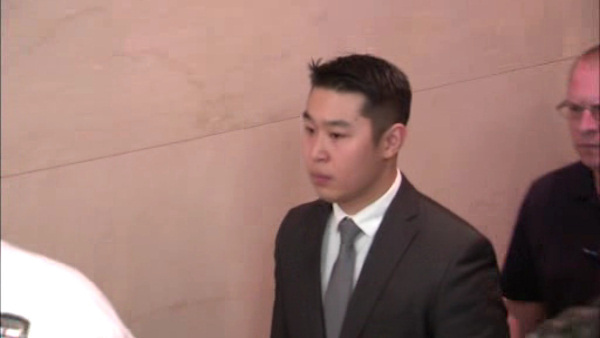 Testifying for the prosecution will be Liang's partner along with victim Akai Gurley's girlfriend. Last week an NYPD lieutenant testified Liang was shaken after shooting Gurley in a Brooklyn housing project stairwell in 2014. A prosecution witness testified Liang and his partner did nothing to help Gurley. Liang was a rookie when he accidentally shot Gurley in a dimly lit stairwell of Brooklyn's Pink Houses. Liang opted for a jury trial, and has indicated he will likely testify in his own defense. In court last month, NYPD Lt. Vitaliy Zelokov recounted the seizure of Liang's gun and the officer's state after the shooting. "I shot him by accident," Zelokov quoted Liang as saying. And he is alleged to have told his partner, "I'm going to get fired." Prosecutors will claim Liang was improperly patrolling the stairwell with his gun drawn, and he pulled the trigger when startled by Gurley. The defense will maintain the gun fired because of a defective trigger. Liang has been charged with second degree manslaughter, criminally negligent homicide, second-degree assault, second-degree reckless endangerment and two counts of official misconduct. The NYPD has called the shooting accidental.